The renovated space includes accommodations for students who struggle to take exams in the traditional classroom. More than 4,000 tests with accommodations were administered by the Palomar College Disability Resource Center last year. 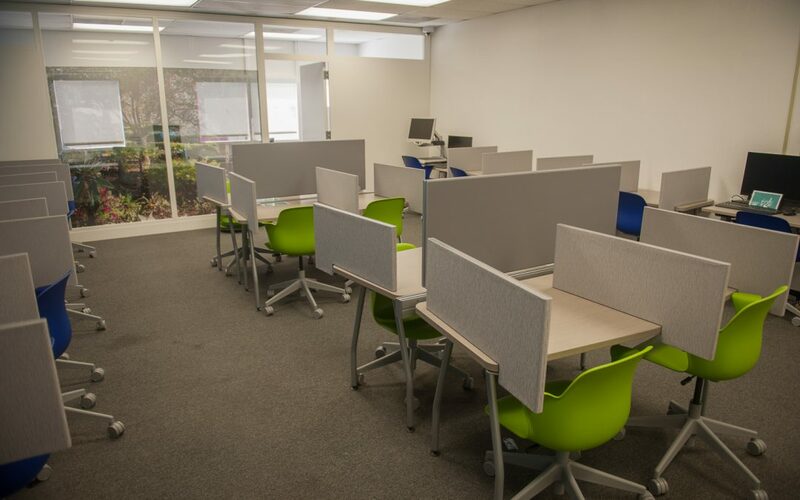 SAN MARCOS — Palomar College opened a newly renovated Testing Center for students with disabilities—a reduced-distraction environment featuring a variety of accommodations to help all of the college’s students pursue their higher education goals. Students who are registered with the Disability Resource Center (DRC) can book appointments in advance to take their tests in the new space, and they receive extra time to complete exams in a setting with less noise and less traffic. The Testing Center also features specialized equipment to serve those with specific disabilities. Moriarty said many of the DRC’s students will only take their tests in the center because of how quiet and calm it is compared to a standard classroom. DRC staff administered more than 4,000 tests with accommodations last year. The center is open Monday through Thursday, 8 a.m. to 6 p.m., and Friday from 8 a.m. until 2 p.m. Tests are administered by appointment only because exam materials must be coordinated with professors ahead of time.